Bits & Scraps Of My Life: !00 day challenge day 4 fave book plus some scrappy business to attend to! !00 day challenge day 4 fave book plus some scrappy business to attend to! If I am really pushed to choose it would have to be Stephen King.....the very first book of his I ever read was the 3rd park of the Gunslinger series......lol. I was ignorant then and didn't know it was the 3rd one.....and I had found it in a bin at Goodwill for 50 cents. Then I grabbed the others.....as much as I liked it it's not my favorite........my favorite has gotta be Green Mile.......and they also did a wonderful job turning it into a movie. My other favorite book is the Lonesome Dove series. Very diverse huh? LOL I have read everything Larry McMurtry has written. Alright.....now onto scrappy business!! Remember a few weeks ago when I had this sketch and I totally had no idea where I had gotten it from? I thought I had lost my mind...literally it was there one day and gone the next. Guess the day I saw it I went ahead and used it......then saw it had went bye bye.....well, turns out I'm not crazy!!! Well not totally anyway :) This same sketch popped up this week over at Frosted Designs as their sketch along Tuesday sketch!! But guess what........because I had probably used the sketch as a jump off point....I couldn't look at my layouts and tell which one it was.....nothing looked like it.....LOL. The scrap gods are messin with me!!!!! Rather than the ornaments I went with snowflakes cuz I am just totally in love with Echo Park!! And It is KILLIN me trying to get featured on their blog.....LOL. They do a lil thing called feature Friday......I think thats what its called.....you can submit your projects vis the facebook fan page or their blog and they pick some each week to showcase. I bet I have submitted 6 or 7 pages......lol. I know they are sick of me over there by now.......wanna get rid of me? FEATURE ME ON YOUR BLOG ECHO PARK!!!! OK, here is my take......basically the same but kinda mirrored. And this cutie is Jesse in the only snow we had last winter......we sure made up for it in the past month or so tho!! Now ain't they just stinkin adorable? LOL Bob and Jesse wearing their little Santa hats :) Jesse slept in his forever.....lol. I used MME papers from the Wonderful Winter collection, there is some basic Grey chipboard here.....and some yummy green felt Thickers. I wasn't sure about this page at first but I'm ok with it. So there ya have it!! Stephen King used to be so awesome!! I loved the green mile too, I couldnt wait for each little book to come out and I would rush out to buy them. Great layouts! 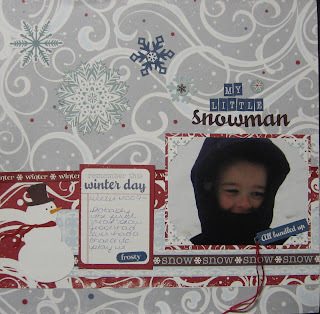 LOVE the papers you are using! sheesh, girl - your scrappin' and bloggin' like crazy! Glad to see you having fun, you deserve it! Fabulous LO's especially the second one. Those photos in the Santa hat are too cute!! how fun are those layouts! Great job! Beautiful layouts! So full of fun and details. Thank you for playing with us at Frosted Designs and I hope you'll join us on our next challenge too. Tina, both of these are too cute!!! 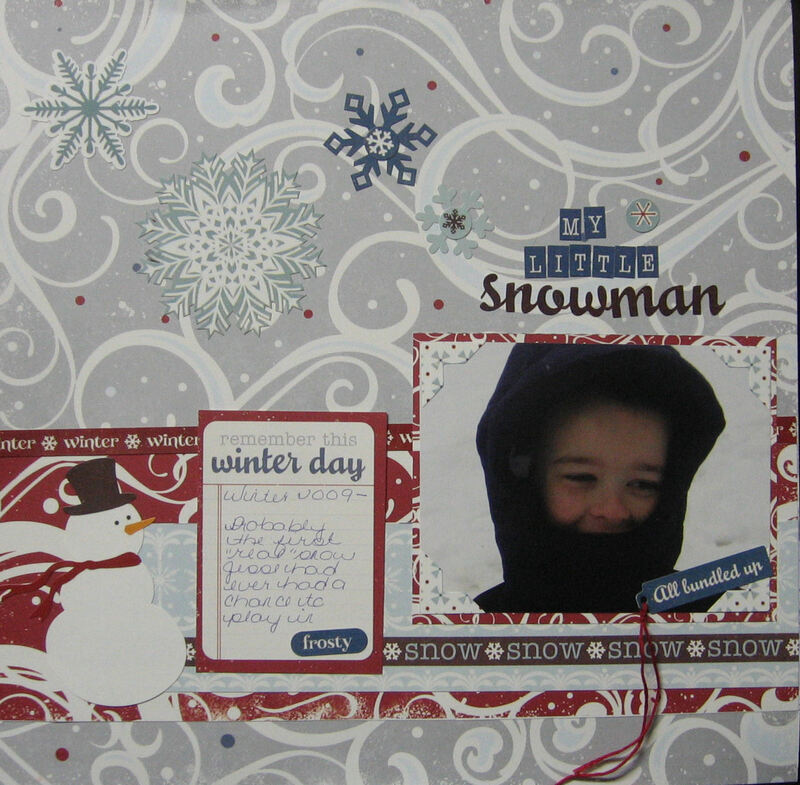 Love the Echo Park papers and the photo of Jesse is perfect with the papers you chose for the Frosted Designs sketch!! So happy to see you play along with us!!! 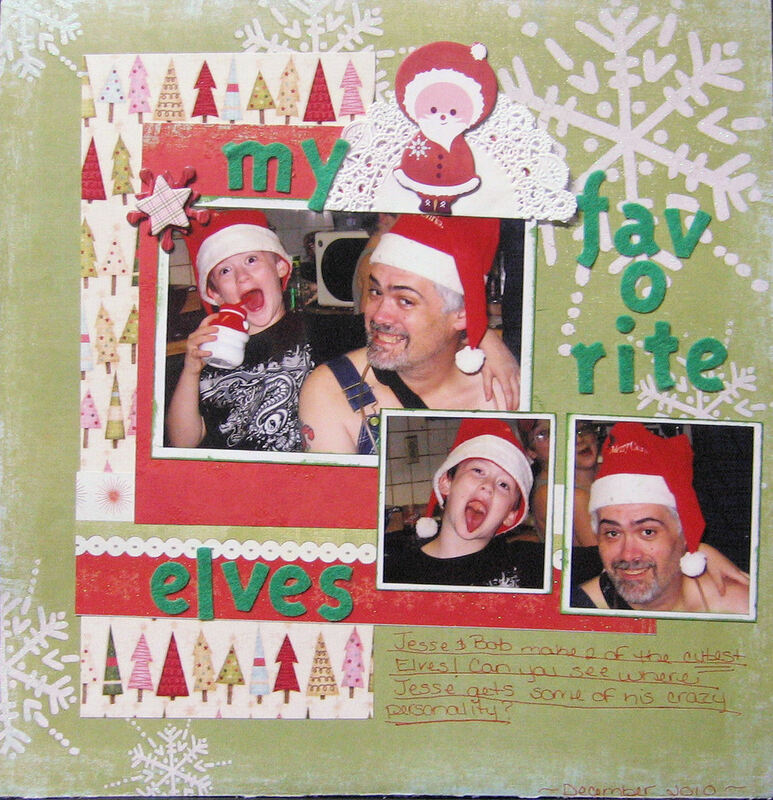 And the other second layout is just "stinkin adorable" Great photos!!! Have a wonderful week!!! Hugs!!! Love how you did "favorite" on that one page... very cute work!! Such a wonderful page! 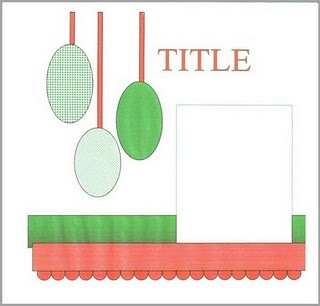 Loving the papers you used and the titlework! This is really fun, love the fun photos and the whimsical design. Thanks for joining the Sketchy Thursdays fun!